Systemlink answers many technical questions every day. We list below some of those most frequently asked.Please click on a question below to see the answer. ​1. How do I choose the correct manifold? There are two basic products to choose from: the SystemLink Zoning Centre or the SystemZone manifold. The SystemLink Zoning Centre contains the SystemZone manifold and SystemLex wiring centre mounted in a cabinet with pumps already attached and prewired, plus automatic air vent and safety valve. 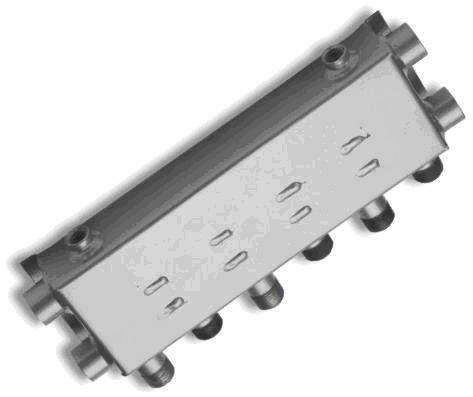 The SystemLink Zoning Centre is sold with 1-inch connections only; however the SystemZone manifold is sold in a variety of sizes with connections up to 2-inches. Add the answers to these questions together to find the number of sets of flow/return pairs that are required. For example, if there is 1 boiler and 4 zones (including DHW), 5 pairs of flow/returns are required - order a SystemZone 5 or a SystemLink 5. Note that the end connections may also be used for a zone. 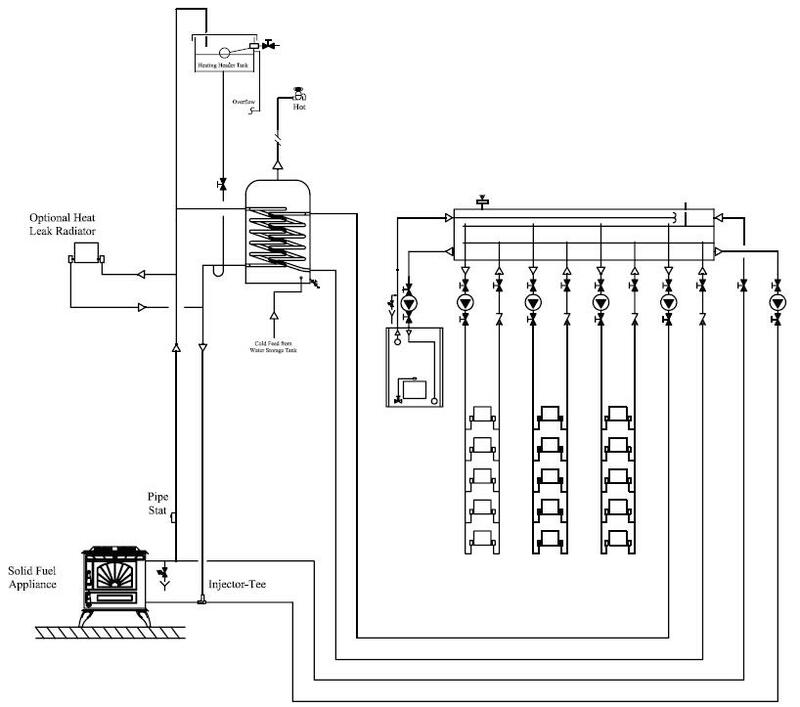 If more than 6 flow/return pairs are required, two manifolds can be linked to provide the extra capacity. For example, if 7 pairs are required, a SystemZone 5 and a SystemZone 4 may be linked to provide this. However, because of the built-in bypass, a pump is necessary between the two manifolds to provide circulation. 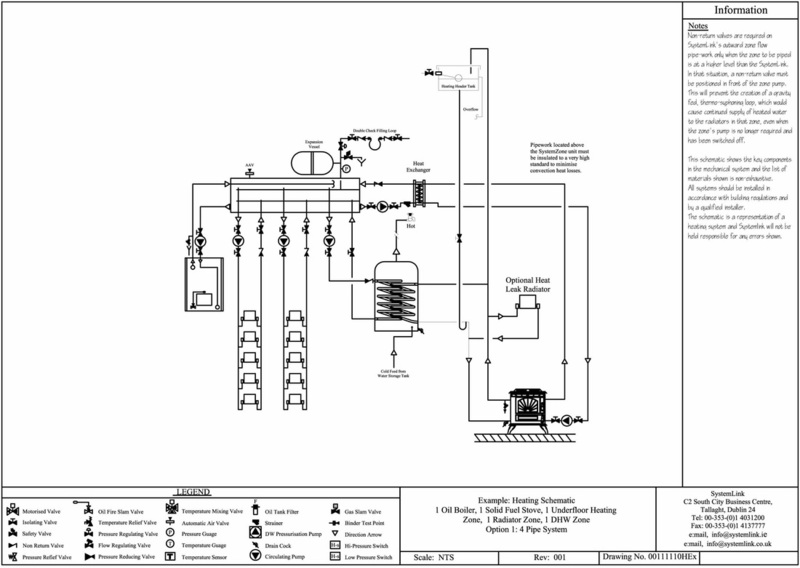 The SystemLink manifold may be used to interconnect solid fuel boilers to oil or gas boiler systems as illustrated below. Any solid fuel boiler must be installed in accordance with the manufacturers instructions. The system will be an open vented system with a thermosyphon circuit from the solid fuel appliance. 4. How can I connect a solid fuel boiler into my existing Sealed system? Any solid fuel boiler must be installed in accordance with the manufacturers instructions. 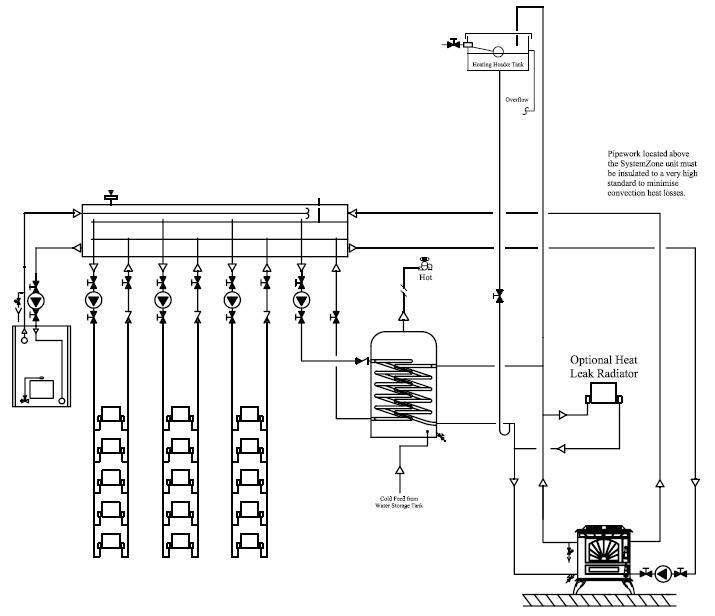 The system will be an open vented system with a thermosyphon circuit from the solid fuel appliance on one side of the heat exchanger and a sealed system on the other side of the heat exchanger. It’s important to note that a SystemLex rather than a MiniLex should be used to control this system. 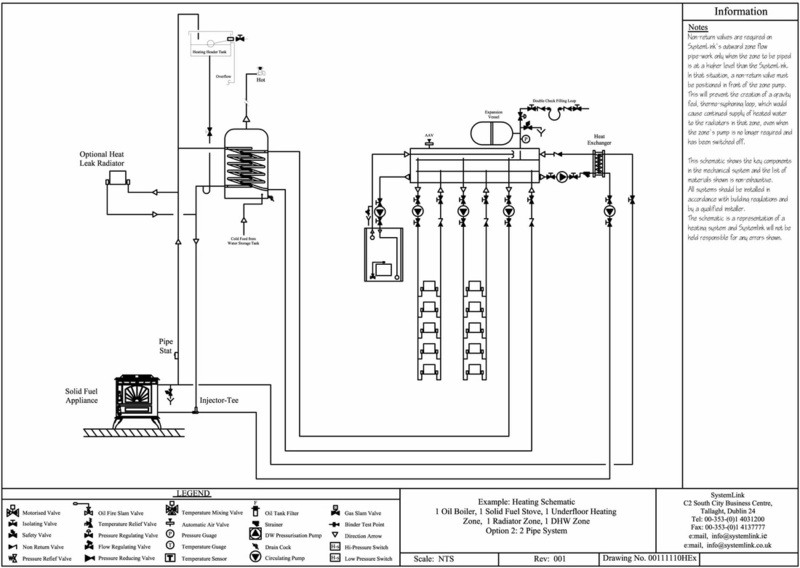 Please consult theSchematics Database for wiring diagrams appropriate for your layout. 5. Do I need to install motorised valves with the manifold? No, the combination of the SystemLink manifold and pumps replaces motorised valves. 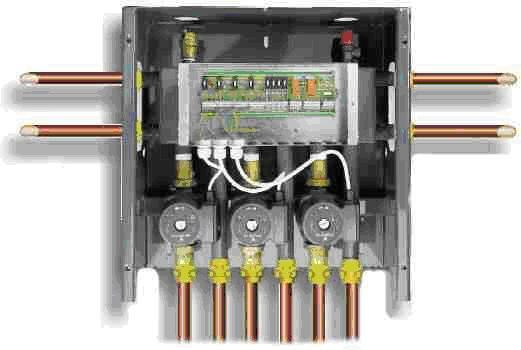 However, simple non-return valves are recommended especially on any zones that are at a higher level than the SystemLink manifold. 6. Is the SystemLink manifold a neutraliser? Yes, it is what’s known as a neutraliser or hydraulic separator but does more than the standard neutraliser. A standard neutraliser is effectively a sealed bucket that takes in flow and return water and lets them mix together freely whereas SystemLink manifolds have a baffle structure inside to separate the hot and cold water, this make for a far more efficient system. 7. Do I need a separate system by-pass? No, there is a by-pass already built into all Systemlink manifolds. 8. Do you sell directly to the public? No, Systemlink products are only available through heating and plumbing merchants. 9. What Size Manifolds are available? 10. Can I link two or more manifolds for extra capacity? Yes, this is easy, but there must be a pump installed between manifolds, otherwise circulation will not occur between them. 11. Can the manifold be turned upside down? 12. Are pumps included with the SystemLink? What size are they? Pumps are supplied with the SystemLink Zoning Centre, but not with the SystemZone manifold. The pumps are Grundfos 25/40. ​13. What is supplied as part of the SystemLink Zoning Centre? The SystemLink Zoning Centre consists of the SystemZone Manifold, SystemLex, Grundfos 25/40 Zone pumps and valves (prewired to SystemLex), safety valve and auto air vent, all mounted in a painted steel cabinet. 14. What is the difference between a SystemLex and a MiniLex? The SystemLex is a 4-zone controller with auxiliary relay that can control 1,2 or 3 heat sources . Each Zone is individually fused. The MiniLex is a simple 3-zone controller with one overall fuse that can control 1 heat source. 15. What is important to know about flow rates? Flow Considerations To operate correctly, the flow into the manifold - the Primary Flow (from the primary heat source) - must at least equal the flow out of the manifold - the Secondary Flow (to the secondary heating or domestic hot water zones). That is, Primary Flow must at least equal Secondary Flow. The ideal condition is where the Primary Flow is equal to the Secondary Flow. In other words, all of the water being supplied in by the boiler is in turn being supplied out to the zones. For the condition where Secondary Flow is less than Primary Flow, there is an excess of hot water being supplied by the boiler to the zones. This is an acceptable situation when the excess of water from the boiler flow travels through the bypass in the manifold to join the water flow returning back to the boiler. Most modern gas boilers will modulate their power output depending on the conditions. The third possible situation is Primary Flow less than Secondary Flow. This is not a desirable situation as it means that the flow of water being supplied to the manifold by the boiler is less than the flow of water required by the heating zones. In this case the shortfall of water flow to the zone results in a flow of cooler zone return water travelling the wrong way through the bypass, thereby cooling the heating zone flow water. In this situation the primary heat source flow remains at high temperature but it is noticeable that the secondary heating zone flow is much cooler.